With healthcare giving less new material for National Review's The Corner, there are some classic utterances coming out. I'm not sure I'd count Cyprus as "European,"
To the left we show the sculpture by Étienne Maurice Falconet of Pygmalion & Galatee (1763). What other elements of Greek mythology are we now dumping from "Europe"? John Ashcroft's law firm is representing William Browder in a convoluted legal action against various Russian entities. The specific expertise of Ashcroft's law firm in the legal action is in what juicy information might be in wire transfers run through banks in New York City. As US Attorney General, John Ashcroft was one of the people overseeing a massive data snoop into the SWIFT international banking transfer system. That system snoop was only supposed to be looking at terrorism-related transfers, but of course all the action was in the procedures for determining what might be a suspicious transfer from a terrorism perspective. For all we know, big sums of money coming out of Russia met the requirement. At the very least, Ashcroft might now have an advantage in this litigation of knowing what to ask for, having seen the guts of the system under the powers given by George Bush to George Bush as part of the war on terror. Unintended consequences and all that. Got that? She was President of Ireland at the same time that the EU was giving aid to the Palestinian administration!!! Who knew that the President of Ireland had much micro-control over the EU budget? Apparently this control is especially strong when the country has the rotating presidency of the EU Council, as Ireland did in 1996, according to Michael Rubin! ("Mary Robinson, War Criminal?") You learn something new every day. Robinson’s record is well known to most Jews with even a passing familiarity with the Jewish media. It cannot be a surprise that honoring Robinson in this way would be anathema to the Jewish community. In addition, I know from having worked in the White House that these selections go through extremely careful vetting of public and non-public databases to make sure that they would not embarrass the president in any way. 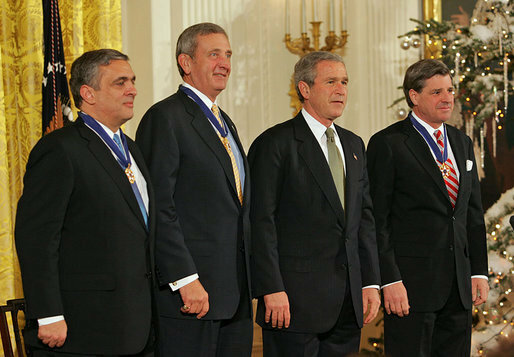 That was General Tommy Franks getting his Victory in Iraq medal from George Bush -- in December 2004. UPDATE: Henry at Crooked Timber takes up the cudgel. FINAL UPDATE: The battle continues. JERRY: Uhm, The thing about eating the Black and White cookie, Elaine, is you want to get some black and some white in each bite. Nothing mixes better than vanilla and chocolate And yet somehow racial harmony eludes us. If people would only look to the cookie all our problems would be solved. UPDATE: Officer Crowley had Blue Moon with what looks like an orange slice. We warned about this plague years ago! BHO's Bud Light looks disturbingly transparent. In centuries to come, the idea that CO2 is a pollutant will represent the summit of political idiocy. Under Benjamin Netanyahu, Israel is the world’s ascendant capitalist country. While the U.S. is immersed in a slough of increasing taxes and regulations, Israel has been privatizing its companies and deregulating its financial institutions. They are reducing tax rates and preserving the key capitalist assets of the West while the U.S. is trying to cap and trade capitalism, suppress energy production, and raise tax rates on everything. As rates rise above 50 percent, entrepreneurs have a greater incentive to shuffle and hide existing wealth than to create new wealth. Sadly, none of his claims about taxation stand up to a consultation of actual Israeli news sources. In fact, as these Ha'aretz articles explain, Bibi is making a dog's dinner of the tax system, increasing the lower rates and payroll taxes all in a quest to be able to tell people like Gilder that he's on the road to cutting the top rate of income tax to 39 percent. No wonder Bibi and George Bush got on so well. So by an amazing coincidence, various conservatives who proclaim themselves utterly detached from the Obama birthplace theories have, on the same day, hit upon the idea that there might be something to it because of all the coverups that seem to be going on, with demands for college transcripts forming the Trojan horse for their birther endorsements. I’m not a birther, myself, but it’s not a bad or unfair question. Why, instead of simply producing the paper, does Obama fight inquiry about it? Why can’t we see his transcripts? The real problem, however, is not the president's place of birth (it is highly unlikely that he was born anywhere but where he claims) but the Nixonian secrecy with which he has chosen to surround himself. Has Obama released his transcripts from Occidental College and Harvard? (we know all about Bush's mediocre grades at Yale). Weird how Bush's Yale grades -- about which he repeatedly boasted -- are such a sore point. Now just about everything in there could be contested but no one complained that by Texas giving legal weight to such a text that it was trying to turn the claims into facts. Although it could have come as news to some of Bush's more deluded followers that he wasn't actually Texas-born. So in a sense there once was a crazy liberal birther movement claiming that Bush actually wasn't from Texas. Except that they were right. But we digress. The main point is that there's now a new movement: the closet birthers. They believe the birthers, or at least want to believe them, but just don't want to say so. Hence the contortion of the "cover up". Much legal ink was expended arguing about whether the detainees in the Guantanamo Bay detention facility meet the definitions of the Geneva Conventions regarding wartime prisoners. The Minister [for Justice] said that, while the two men being accepted by Ireland were not being admitted as refugees within the meaning of the Geneva Convention he intended to adhere to the norms of official procedure in respecting the rights of the two men to their privacy. So they're not refugees according to the UN definition either. It's not clear what particular aspect of the definition might pose a problem. As her bio shows, she's a career diplomat. So this is an upgrade for Mauritius and the Seychelles, who under George Bush got a Puerto Rican construction magnate, Cesar Cabrera. Yes, it's funny to have William Shatner read the first few paragraphs of Sarah Palin's farewell stream of consciousness speech, but even that doesn't do justice to the original. Watch the first few minutes and picture an address from the White House along those lines. Thanks John McCain! A visit to India included a claim of €80 by the official for tips “forked out to the Indians for moving the luggage around airports, hotels etc”. One of the many groups that have popped up once healthcare reform was back on the agenda is "Conservatives for Patients Rights". You have to spend quite a bit of time scrolling around their website to find out much about them, and their analytical material, such as it is, leans heavily on the Cato Institute. After a bit of digging, one does find more details including about the group's principal, Rick Scott. And lots of promises of "grassroots" activism, which of course is a feature that conservative lobbying organisations like to shop to potential clients. But anyway, here's the main point. Try to figure out from CPR's website what their position on pre-existing conditions is. It looks like it's either (a) they don't have one or (b) they actively oppose any kind of mandate on insurance companies regarding preexisting conditions. It's something of a mystery to this blogger why the those in favour of healthcare reform have not hit much harder on the problem of denial of insurance coverage based on preexisting conditions, since it's something that the public is prone to understand as unfair and once solutions are discussed, the economics of the current system tends to unravel -- because the massive cherry pick available under the current system as an implicit subsidy to insurance companies would disappear. For example, to the extent that George Bush was willing to discuss solutions to pre-existing conditions at all, it was a vague proposal to dump all such people into taxpayer-financed risk pools, and John McCain would mumble something similar during the last campaign and then hastily move on to another topic. Shouldn't part of the debate involve making conservatives talk about the parts of healthcare that they don't want to talk about? Since conservatives are the quickest to attribute everything Barack Obama does to race, how long before there is "outrage" at his remarks in Illinois last night which offered some credit for the Mark Buehrle perfect game to DeWayne Wise for the dramatic 9th inning catch? The fact that Obama's analysis was identical to that of the ESPN pundits won't change their attribution of motive one bit. This may set a record as the first time that a Republican has acknowledged that tax increases affect doctors. Because the more typical claim is that tax increases hit Joe the Plumber, joint police-fire households, and small business owners -- where "small business owner" includes, for example, Cindy McCain. In fact one of the many dodges in George Bush's sales pitch for tax cuts was to ignore the fact that subchapter S-corporations are a favoured tax vehicle of lawyers and doctors. Apparently we're about to hear a lot more about the victims of higher taxes in the professions. New Jersey Department of Corrections records showed that Mr. Shakur was convicted in Hudson County and sentenced to five years in prison, indicating that he may have been released recently. The shotgun the police said he used on Thursday was reported to have been stolen in North Carolina in 2007. The shotgun the police said he used on Thursday was reported to have been "stolen" in North Carolina in 2007. Guns reported stolen in states with lax gun laws are of course a key channel of transmission of weapons into northern cities. Apparently the 2nd amendment includes a right to keep, bear, and lose arms, no questions asked. 2009: Navan, County Meath, cinema denounces Brüno as "vile" (although they're still showing it). Early 1970s: The recent Horslips reunion recalled the time that they were banned in Navan, which was a pivotal boost to their careers. Good to know that some things don't change. A long time ago, a smart alecky blogger was sneering at the Wall Street Journal editorial page for suggesting that US military spending should be counted as part of the US foreign aid program since it goes to defend freedom and stuff. Given the significant contribution that this Programme is making to overseas development by guaranteeing the security of people and property, it is recommended that this expenditure count as part of Ireland’s expenditure on foreign aid. While the Group is aware that such a recommendation is inconsistent with the OECD’s Development Assistance Committee rules and that military expenditure (even for humanitarian purposes) does not come within the standard international accounting treatment of ODA, the Group considers that Irish commitments in this regard should be reflected within Government accounts by reference to the totality of humanitarian related expenditure, thereby fully recording Ireland’s distinctive tradition of whole hearted engagement in peacekeeping operations. Now if they want this as a wheeze for a government talking point, fine. But as an argument that would win any kind of international acceptance, it's bogus. While no one doubts the value of UN peacekeeping operations, many of them do not protect poor people, the assumed targets of a foreign aid program. Now those people might be poor if the peacekeepers weren't there but if you were allocating funds to the most destitute people in the world, people on borders in Israel-Lebanon or Cyprus wouldn't count. People in Chad would, but then other countries (like France) are spending far more on peacekeeping for poor people than Ireland. But second, many of the biggest contributors to peacekeeping operations are themselves extremely poor countries. Pakistan, Bangladesh, and of course the African Union operations, for example. Thus by the new Irish definition of foreign aid, poor countries might become the biggest donors! So please lads, keep this talking point for domestic consumption only. Otherwise get ready to be laughed off the stage. In other words, yes, the director of Human Rights Watch's Middle East division is attempting to raise funds from Saudis, including a member of the Shura Council (which oversees, on behalf of the Saudi monarchy, the imposition in the Kingdom of the strict Wahhabi interpretation of Islamic law) in part by highlighting her organization's investigations of Israel, and its war with Israel's "supporters," who are liars and deceivers. It's just not true that the Shura council oversees the imposition of Islamic law. The Shura council is a purely consultative body: the King appoints them, the King sends laws to them for consideration, the King promises to listen to them (and tribal norms create an expectation that he will), but ultimately they have no power to impose anything. The real power on the religious side lies with the various judicial institutions, the religious councils, and the gloriously named CPVPV (council for the promotion of virtue and prevention of vice). In fact, King Abdullah's Valentine's Day Massacre tapped the Shura council to smooth out the worst of the lunacy that was coming from the religious institutions, and the Shura council is one of the safe havens for airing of potential reforms in Saudi Arabia. They're not loonies. Having one of them at a meeting is not disqualifying. UPDATE: Matthew Yglesias has the subtext for the outrage. FINAL UPDATE: If the allegation was that Human Rights Watch adjusts its message to the needs for Saudi fundraising, they have a strange way of showing it -- by issuing a blistering report on the treatment of the Shia minority in Saudi Arabia! For a change of pace, a little city blogging. The picture above is the children's playground behind Francis Junior High School in Washington DC. 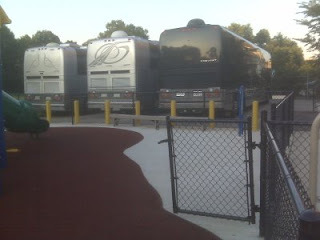 Immediately outside the fence, 3 huge buses are parked. Besides the physical obstruction, the bus on the right (TN plates, 0678 BA) has a motor running -- adding fume and noise pollution to the toddler playing experience. All buses are apparently unoccupied. A DC police officer states that while he understands the annoyance, the bus is probably not breaking any laws since it's running a generator and not its main engine, and in any event is not in a residential area. So it's just the kids and their parents who deal with the fumes and noise. Local intelligence says the buses belong either to MTV's The Real World or the latest Reese Witherspoon vehicle, How do you know? How do you know whether the headache is due to low-level carbon monoxide poisoning or the constant hum of the bus motor? This work by http://bestofbothworlds.blogspot.com is licensed under a Creative Commons Attribution 3.0 United States License. Judge Sotomayor answering Sen. Hatch [almost a quote]: All decisions of the Supreme Court I consider 'settled law' to the extent that the doctrine of stare decisis (respect for precedent) applies. In other words, all law is settled ... except when it isn't. SEN. SPECTER [as read into the record by Sen. Feinstein]: "Judge Roberts, in your confirmation hearing for the circuit court you testified: 'Roe is the settled law of the land.' Do you mean settled for you, settled only for your capacity as a circuit judge, or settled beyond that?" SPECTER: "You went on to say then, 'It's a little more than settled. It was reaffirmed in the face of a challenge that it should be overruled in the Casey decision, so it has added precedental value.'" Thus "settled law" is indeed a precedent that stands until it doesn't, which is the wheeze that John Roberts came up with to get through his confirmation hearing. Looks like Sonia decided to follow precedent! Today in Dublin there was a ceremony for the National Day of Commemoration, which honours all Irish people who have died in past wars. The current form of the day reflects decades of controversy, but one wonders if it has now taken a little too much of the Celtic Tiger ethos where objectives of worthiness and Irishness (as defined by an elite) obliterate actual content. Read the announcement of the Taoiseach's office about the event. Is it clear whether the ceremony is for soldiers or for any Irish person who died in any war? Kevin Myers might want to know whether Sean Russell is included. Now of course it's great that Islamic and Coptic Orthodox Church representatives are invited to participate. But those religions had no role in Ireland's tangled messy history, the underyling reason for having such an event. Finally, a quirk of the calendar sees this year's commemoration taking place on the 12th of July. Do the gentlemen above constructing a 60 foot bonfire in Belfast seem much interested in the National Day of Commemoration? But -- and we ask this seriously, not sarcastically -- has the day really fulfilled its purpose if it tries to carry on including everyone except the people who still embody the divisions of Irish history? That's Malia Obama sporting a t-shirt with the Campaign for Nuclear Disarmament logo. Why do the Obamas hate spending hundreds of billions of dollars on weapons that can never be used? In historical fact, Vietnam was the liberals' war, begun by JFK, escalated by LBJ, and cheered on for years by giants of the American left before they turned against it ... As with Vietnam, American liberals also turned against the Iraq war after first supporting it. The crucial difference is that President Bush never lost his nerve. Despite the difficulties after the 2003 invasion and the terrible setbacks of 2006, he replaced his generals, sent more troops and embraced a new counterinsurgency strategy. The insurgency was defeated, and Mr. Bush left office with Iraq as a united, self-governing ally. What this reveals is the neocon nostalgia for the "liberal hawk" shite that briefly became the "reasonable" position (inside the Beltway) in the run-up to the Iraq war. What it ignores is the role of Vietnam itself (along with the backlash against civil rights) in fracturing the Kennedy-Johnson version of the Democratic party. And the echoes of Vietnam in the sales pitch for the Iraq war. Real liberals were against both of them. even though the ones we were holding at Gitmo were trained in al-Qaeda-affiliated camps. The Wall Street Journal (as flagged in the NRO web briefing) reports on rioting in China by Uighur "students" that has left scores dead and hundreds wounded ... No reason for non-Muslims in Bermuda, Palau, or the United States to worry, though. The lovable Uighurs are merely trying to address "economic and social discrimination." Once they get social justice, I'm sure they'll stop. So there you have it. We're taking the Chinese government's word for what happened and assuming that all the Uighir dead must be some kind of terrorist agitators. The obvious problem is that for this "argument" to have any scientific content, it should come with statistics showing that these problems are not significant in the US healthcare system. Which Steyn and Goldberg don't provide. Now one can't know whether they even looked, but as it happens, it's not easy. Centralized health systems, or at least those with centralized financing, produce centralized health statistics. Balkanized provisions systems like the US don't. [Link] Hospital-acquired infections with Staphylococcus aureus, especially methicillin-resistant S. aureus (MRSA) infections, are a major cause of illness and death and impose serious economic costs on patients and hospitals. However, the recent magnitude and trend of these infections have not been reported. We used national hospitalization and resistance data to estimate the annual number of hospitalizations and deaths associated with S. aureus and MRSA from 1999 through 2005. During this period, the estimated number of S. aureus–related hospitalizations increased 62%, from 294,570 to 477,927, and the estimated number of MRSA-related hospitalizations more than doubled, from 127,036 to 278,203. [Link] US hospital discharges for which Clostridium difficile–associated disease (CDAD) was listed as any diagnosis doubled from 82,000 (95% confidence interval [CI] 71,000–94,000) or 31/100,000 population in 1996 to 178,000 (95% CI 151,000–205,000) or 61/100,000 in 2003; this increase was significant between 2000 and 2003 (slope of linear trend 9.48; 95% CI 6.16–12.80, p = 0.01). The overall rate during this period was severalfold higher in persons >65 years of age (228/100,000) than in the age group with the next highest rate, 45–64 years (40/100,000; p<0.001). CDAD appears to be increasing rapidly in the United States and is disproportionately affecting older persons. So apparently a damning indictment of the US healthcare system would be available if newspapers just started writing up a few of these cases. UPDATE: Paul O'Neill in the New York Times on the high cost of hospital-acquired infections in the USA. Palin: We have trade missions back and forth, we do. It's very important when you consider even national security issues with Russia. As Putin rears his head and comes into the air space of the United States of America, where do they go? It's Alaska. And so as I thought about this announcement, that I wouldn’t run for re-election and what that means for Alaska, I thought about, well, how much fun some governors have as lame ducks. They maybe travel around their state, travel to other states, maybe take their overseas international trade missions.So many politicians do that. And then I thought, that’s what wrong. So where is that foreign policy experience for Palin-Limbaugh 2012 going to come from?. Since just about anything that Barack Obama does these days seems to convince the angry right that their crackpot theories about him are correct, how long before someone gets working on his imminent Ghana visit as proof of him as someone obsessed with neocolonialism, pan-Africanism, or whatever other reactionary interpretation can be placed on the choice of sub-Saharan Africa's post-war independence pioneer? 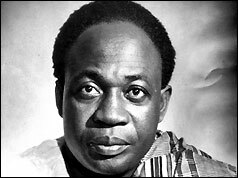 Such fun to be had with an Obama-Nkrumah comparison! When in fact he seems to be going because he wanted to find a place to make sub-Saharan Africa seem not so neglected in his Presidency. Of course he could have done that by going to Kenya ... but then the crackpot theories would truly explode. About him really being Kenyan and all.